Have a young adult novel—or a YA novel idea—tucked away for a rainy day? Are you putting off pitching your idea simply because you’re not sure how to pitch an agent? No problem! All you have to do is submit the first 250 words of your novel and you can win both exposure to editors, and a one-on-one chat with one of New York’s TOP literary agents Regina Brooks. ADDITIONALLY: The top 20 submissions will all be read by a panel of five judges comprised of top YA editors at Random House, HarperCollins, Harlequin, Sourcebooks and Penguin. All 20 will receive free autographed copies of Writing Great Books for Young Adults by Regina Brooks. Of the 20, they will pick the top five submissions and provide each author with commentary. ONE Grand Prize Winner will win a free 10-week writing course courtesy of the Gotham Writer’s Workshop. YA literary agent Regina Brooks, along with editors at Sourcebooks, will read all of the entries and determine the top 20 submissions. These submissions will then be read by Dan Ehrenhaft, head Acquisitions Editor at Soucebooks Fire; Alisha Niehaus, Editor at Dial Books for Young Readers (Penguin); David Linker, Executive Editor at HarperCollins Children’s Books; Michele Burke, Editor at Knopf Books for Young Readers (Random House); and Evette Porter, Editor at Harlequin. These judges will whittle the top 20 down to four winners and a grand prize winner—all five will be provided commentary on their submissions. An Essay contest for kids. Go to Florida to meet Winter the dolphin. 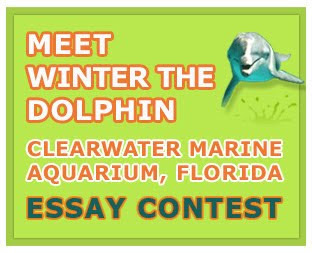 Winter the Dolphin has been an inspiration and hero for children and adults alike. When Winter was just three months old, she was rescued from a crap trap which had seriously damaged her tail. It wasn't clear that she would survive but she did. However, the damage to Winter's tail was so extensive that it fell off. To everyone's amazement, a prosthetic company stepped in an fitted Winter with a prosthetic tail. Now Winter is using her new tail and thriving. All entries must be received by November 30, 2009. Winners will be announced on or around December 14th. No purchase necessary. Open to legal residences of 50 United States and D.C. ages 6-14 as of November 30th 2009. Void where prohibited. Click here for complete contest rules. Labels: Contests, Essay contest for kids, winter the dolphin. The Monsterologist - A review. With Halloween just around the corner, many young (and not so young) people are thinking about witches, spiders, carved pumpkins, ghosts, and ..... monsters. I just reviewed a book that will delight monster enthusiasts of all ages. 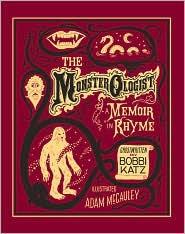 It is called The Monsterologist: A memoir in rhyme. The world is full of ologists of all kinds. There are biologists, zoologist, botanists, psychologists, and now there is a monsterologist. He is a very brilliant man who travels around the world looking for, and even getting to know, monsters of all kinds. For the first time ever, the monsterologist has brought together letters, interviews, and notes that he has in his collection so that you can read about some of the secrets of the world’s most famous monsters. Enjoy reading a letter from Count Dracula, and shudder as you read a recipe that the monsterologist believes belonged to Grendel’s mother. Read the “Ghost Notes” that the monsterologist has selected, and find out how three famous dead musicians still walk the earth. Learn what it was like to seek a yeti in “the snowy Himalayas.” Don’t forget too to look at the email offer that the monsterologist received inviting him to co-direct a zombie survey. This highly entertaining and deliciously inspired book is sure to delight any budding monsterologist. With clever rhymes, a varied selection of formats, and wonderful multi-media artwork, this is a book that readers will dip into again and again. Do visit the Monsterologist website to play a game, to find out more about the monsterologist, and to listen to a reading of some of the poems in the book. Labels: Children's book reviews, Poetry books, The monsterologist, website. Don't forget that October 18th to 24th is Teen Read Week in the U.S. This year's theme is Read Beyond Reality, which encourages teen readers to read something fantastical or science fictional, and to explore worlds that have never been. You can find some excellent book and media suggestions here, and more ideas and information about this even here and on the ALA website. If you have a teen in the house, you might be interested to know that teens can vote for the 2010 Teen Read Theme. Click here to vote. The winner will be announced at the 60th National Book Awards Benefit Dinner and Ceremony in New York City on Wednesday, November 18th. You can find out more about the awards and the National Book Foundation on the NBF website. Just last week my daughter and I were making breakfast when we heard, on the radio, that President Barack Obama won the Nobel Peace Prize. My daughter wanted to know what the prize is. Luckily I had just reviewed a splendid book about Alfred Nobel and I pulled it off my shelf for her to read. If you too have a child who wants to know about these prizes then take a look at the review I wrote about the book. Years ago, when people wanted to build bridges or roads, they had to blast a path for their work using gunpowder - which wasn’t a safe material to work with. One day Alfred Nobel realized that a substance called nitroglycerin might be safer to use than gunpowder. With the help of his brother and father, Alfred experimented with nitroglycerin until he came up with a solution that he was sure would work. Though his new invention did work well, it still wasn’t as safe as Alfred had hoped it would be. His brother Emil was killed went something went wrong in the lab. Surely there was something else that Alfred could do to make his invention safer still. Eventually Alfred created something that was safe. It came to be called dynamite and Alfred became a rich and famous man because of his invention. Alfred had hoped that his invention would foster peace, and he was very distressed when he saw that it was being used to harm people. 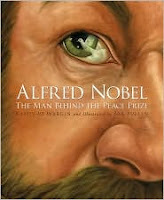 It saddened him to know that many people “saw him as the man who earned his wealth by inventing ways to injure and kill.” Thankfully, Alfred found a way to leave a legacy that would celebrate peace and reward those who gave the world new innovations in science, and who created memorable written works. This thought provoking and memorable book celebrates the life and achievements of a truly great man. Please visit this page to find an interesting and very useful teacher's guide for the book. I am a huge fan of Winnie-the-Pooh. He is one of those characters I fell in love with when I was around four or five, and I have been in love with him ever since. I was a little unsure of what to think of the new Pooh book when I heard about it. Would this book be a tribute to A.A.Milne's creations, or would it be a black spot on the name of all things Pooh? Well, I now have a copy of Return to the Hundred Acre Wood, and I began to read it within fifteen minutes of recieving it. And within minutes I was chuckling, smiling and nodding my head. So far, the author, David Benedictus, has captured the essence of Poohness. I am only on page 25, but I plan on climbing into bed with the book shortly. Armed with a cup of tea and with my trusty sidekick sitting next to me - the Pooh my godmother made me when I was very little - I will read on. Watch this space for more. Winter's Tail - An inspirational story - Prize Pack Giveaway! 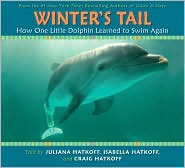 Last week I read and reviewed a delightful book about a baby dolphin who has managed to overcome a severe physical handicap, the loss of her tail. 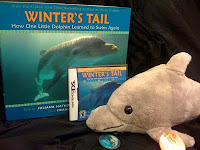 The book is called Winter's Tail: How one little dolphin learned to swim again. This true story is not only inspirational, but it also shows young readers that even the worst of tragedies can have a happy ending. One winter morning a baby dolphin got tangled in a crab trap. The ropes of the trap were wrapped around the baby dolphin’s tail and the tail was severely injured. A local fisherman freed the baby from the ropes, and then he called for help when it was clear that she was not doing well at all. A few hours later, a rescue team arrived. The baby, who was named Winter, was taken to the Clearwater Marine Aquarium in Florida. 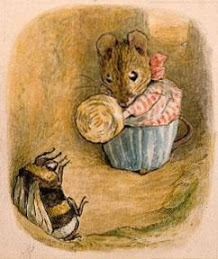 There she was fed with a milk mixture and her wounds were tended to. Unfortunately, Winter’s tail had been so badly damaged that it fell off. All Winter had to swim with was a stump. She did manage to learn how to swim with her stump, but she had to move her body from side to side like a fish, instead of up and down like a dolphin, and this movement started to affect her spine. e country heard about Winter and her accident, and the one person came forward with a solution for Winter’s problem. Animal lovers of all ages will greatly enjoy this inspiring and moving story about a courageous dolphin who, with the help of human technology, has been able to overcome a severe physical handicap. Filled with wonderful photos, this is a story that is uplifting and full of hope. A Winter’s Tail prize pack! Don't forget Jumpstart's Read for the Record. On October 8th people all over America will be reading Eric Carle's book The Very Hungry Caterpillar. Consider holding an event in a local school, business or library to raise awareness about literacy issues, and to raise money so that Jumpstart can put books into the hands of children. announced Jumpstart’s fourth annual Read for the Record Campaign today at the International Reading Association convention in Minneapolis. On this one day in October in thousands of settings across the world, readers of all ages will be joining together to break the record for the number of people reading the same book on the same day. Lauer and Meredith Vieira of NBC’s TODAY Show , award-winning actress Mary Louise Parker, and Grammy Award-winning recording artist/actor, LL Cool J. The special limited edition can be purchased online at www.readfortherecord.org/books, where people can also donate books to children in need. other learning,” said Pearson Foundation President Mark Nieker. “Additionally, the Read for the Record Campaign shines the spotlight on the critical role Jumpstart is playing in closing the gap in school readiness between children from low-income communities and their middle income peers.” Over the past three years, more than one million people have taken part in this record-breaking Campaign. Jumpstart’s Read for the Record has raised more than $3 million to support Jumpstart’s mission and more than 500,000 books have been donated to children in need. In addition, Jumpstart and Pearson’s innovative Read for the Record collaboration has been awarded a coveted Cause Marketing Halo Award. The campaign is further supported by national campaign sponsors American Eagle Outfitters and Sodexo. For more information, visit www.readfortherecord.org and www.pearsonfoundation.org. In addition to information on how to participate, the websites provide information about donating books to Jumpstart children, as well as hosting and joining shared reading events across the nation. Here in Oregon we sweltered our way through most of September until this week. Now fall is here, all of a sudden. Indeed it landed on us with a thump! There even was frost on the hills above town yesterday, and some places at higher elevations got their first snow. Hearing about the snow I was reminded of a book that I reviewed a week or so ago. It is called Waiting for Winter. I know I am jumping ahead a little, season wise, but this book charmed me so much that I just have to tell you about it. Here is my review. Be warned, this book will really make you laugh! !